Ever since we first met at Freshman Orientation at UCLA, S and I have made it our tradition to take each other out to dinner for our birthdays every autumn. The birthday girl always gets to select the venue, so a few weeks ago, I met her in front of a place that’s been on my list of must-try restaurants since it opened less than two years ago — Chef Andrew Kirschner’s Tar & Roses. Boasting a seasonal farm-to-table menu of small tapas-style plates alongside an extensive wine list, Tar & Roses has been well-received and earned some rave reviews on Yelp and in the blogosphere. And after our fabulous dinner experience, I can definitely attest that it is worth the hype. Speaking of hype, the crowd is still going strong. Even on a Sunday night, without reservations, we barely managed to snag a pair of seats at the counter. What a stroke of luck that turned out to be – the counter is totally where it’s at! A quick peek into the kitchen and close proximity to the bruschetta and charcuterie board (not quite legible from other parts of the dining room), we enjoyed the relaxing ambiance and casual vibe in the otherwise cozy and romantic restaurant. First, a crostini to start. If you’ll recall from our sushi adventures, S and I both love fishy fish. 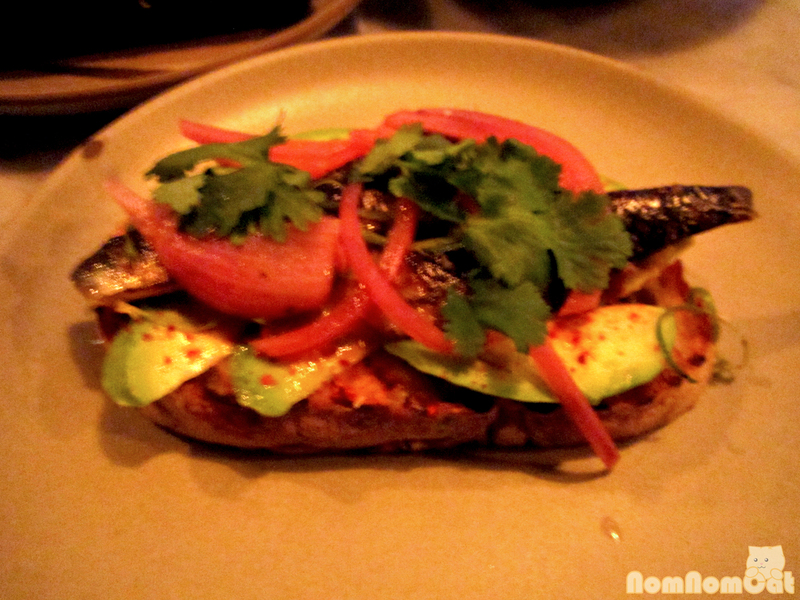 Atlantic sardines certainly fit the bill. The oily, salty fish paired well with the creamy avocado and tangy pickled onion. There was also a subtle sprinkling of cayenne to give it an extra kick. 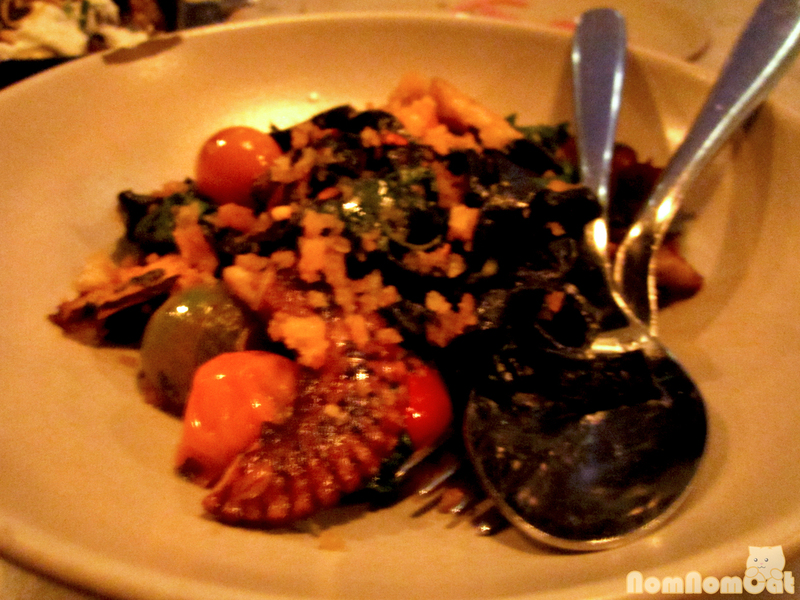 I LOVE squid ink pasta, but I’ll be honest, what really stole the show in this dish were the melt-in-your-mouth, extremely tender bites of octopus. Beat it against a rock? Massage it with salt? Boil it with wine corks? Every cook has his own secret for yielding the most absolutely perfect texture. I have no idea how they do it here, but I could eat a giant bowl of this and be happy. 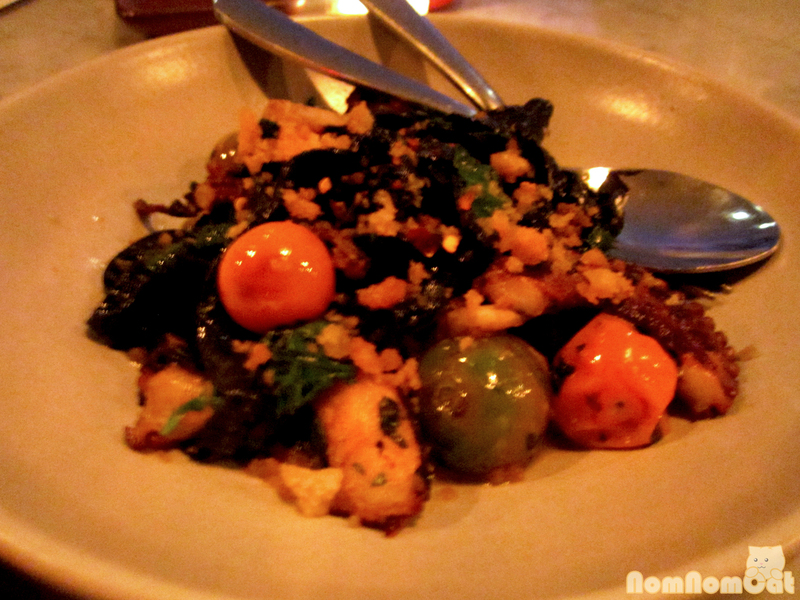 The heirloom cherry tomatoes were a nice touch for their color and sweet-tart flavor. S: “I don’t know what sunchokes are, but let’s get this.” Arguably the best executive decision of the night. Sunchokes are tubers with very little starch but plenty of fructose. 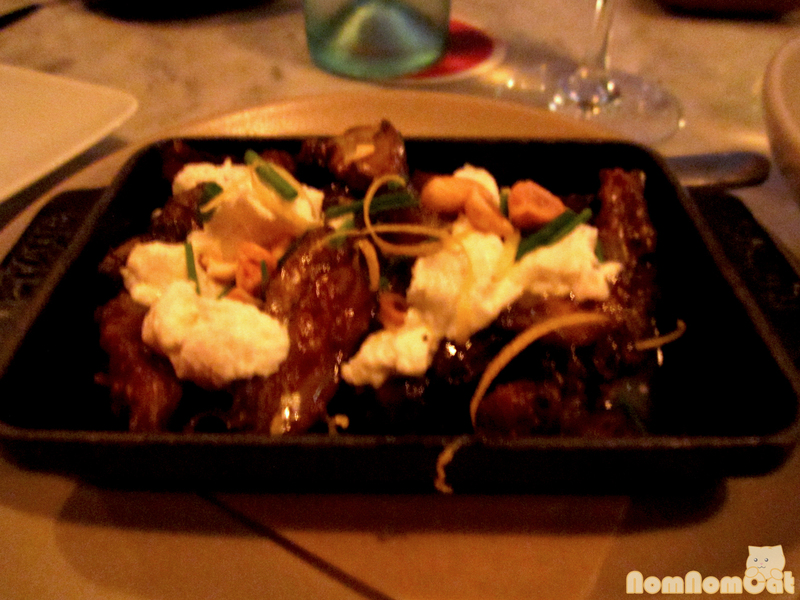 They caramelized beautifully and when paired with the tart dollops of goat cheese, fine shreds of lemon zest, and crunchy hazelnuts, it was like magic. I don’t even like goat cheese. I also rarely eat hazelnuts outside of nutella. But this… this was pure delight for my palate. 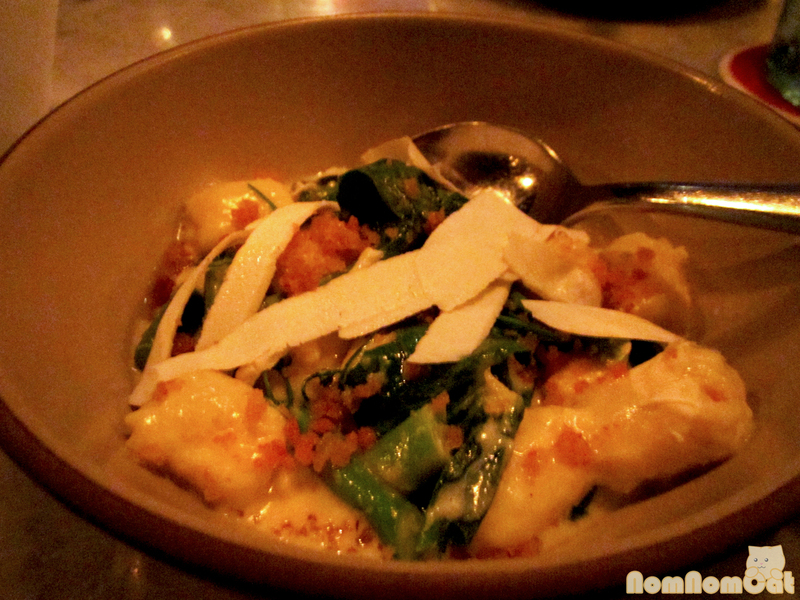 Though I generally prefer potato-based gnocchi, these ricotta ones completely disintegrate on the tongue. 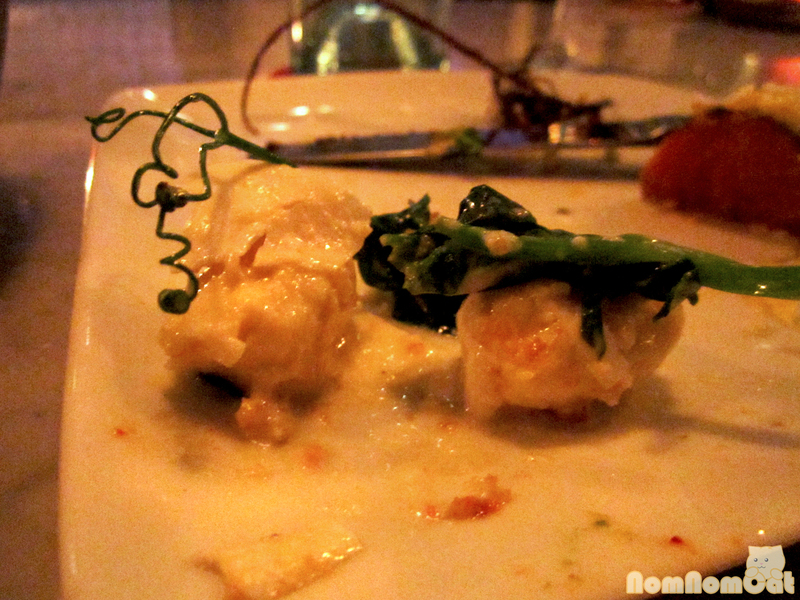 They’re like light, fluffy clouds, coated in a creamy sauce and enveloped in wilted, sauteed pea shoots. We even found this lovely tendril and just had to take a close-up of it. Twisty-twirly tendrils generally remind me of spring, but these spiraling greens have just come into season (from now through early spring). What a treat! I love beets, especially when they’ve been roasted. I know some people say they taste like dirt, but I prefer to call it earthiness. 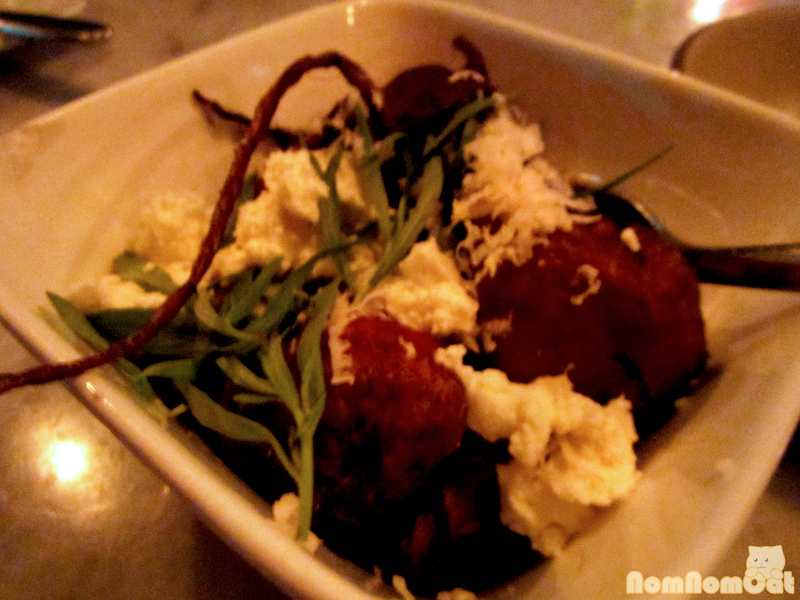 Topped with feta and fresh sprigs of tarragon, this dish reminded me of everything I love about fall. Of course, we had to save room for dessert. We decided to splurge and each get our own. 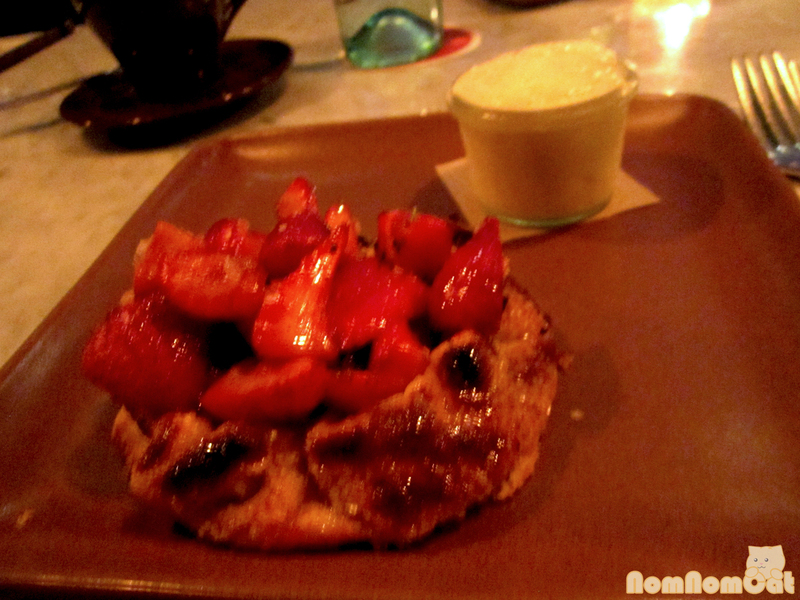 S chose the strawberry crostata – a crisp pastry topped with fresh berries and served with honeycomb ice cream from LA Creamery (amazing!). The strawberries were macerated in a bit of salt which provided a nice contrast. 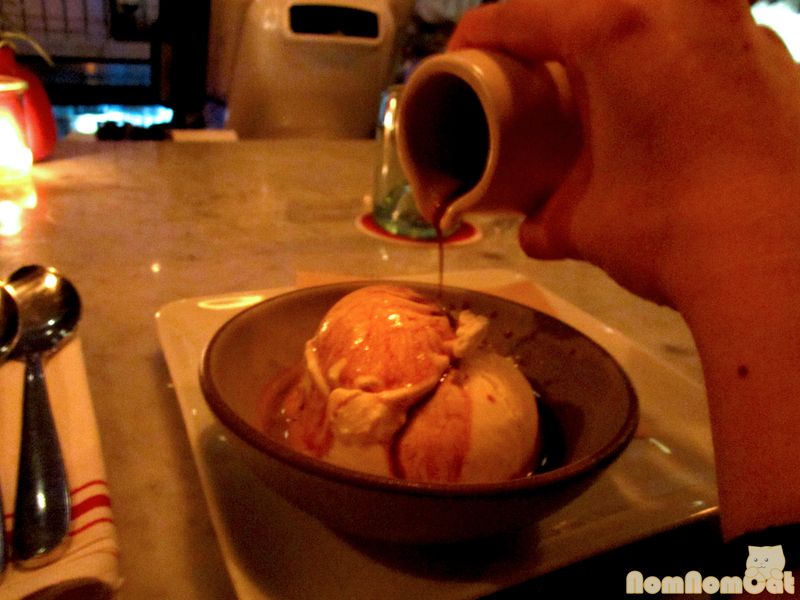 As soon as we were handed the dessert menu, one single word jumped out at me — affogato. i knew I had to have it. S, in her adorable artsy-ness, took it upon herself to stage an “action shot” for the benefit of NomNomCat readers. 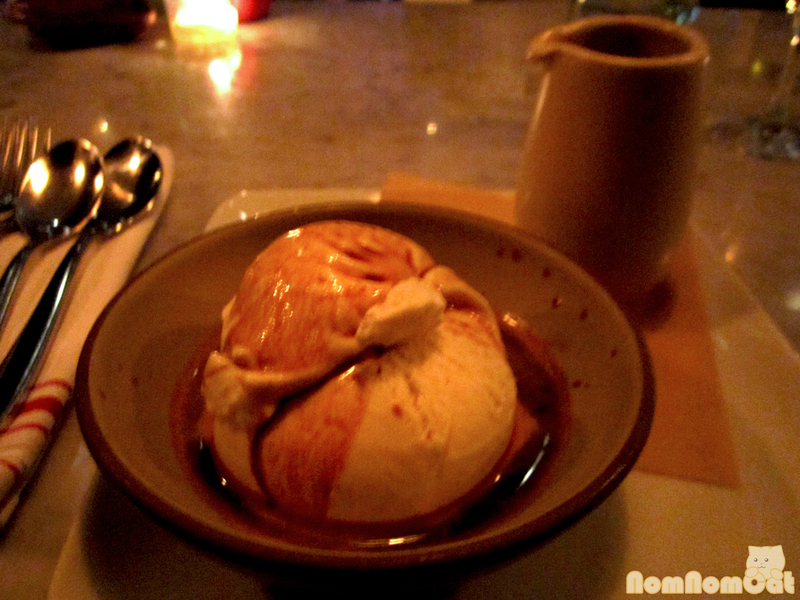 Decadent Tahitian vanilla ice cream (also LA Creamery) drenched in steaming, bitter espresso from Stumptown Coffee, this dessert was about as trendy as it gets, but it was the perfect end to the wonderful meal. 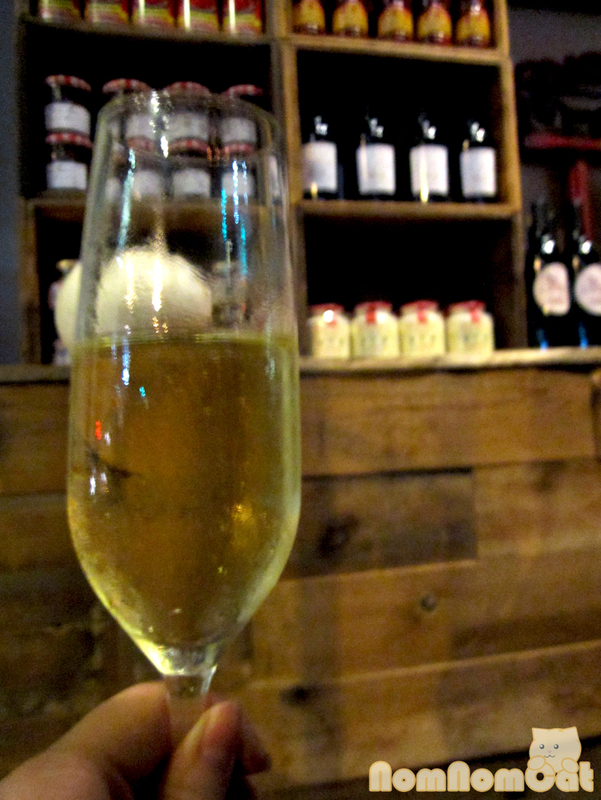 All in all, I loved the rustic decor, the seasonal dishes, and the friendly staff. I will definitely be back with M in tow, and you can bet we’ll be stalking Open Table for a reservation next time. If Tar & Roses has been on your list of LA bookmarks, well, what are you waiting for?? Do yourself a favor and check them out!